One of the complaints leveled against Ghostbusters 2 was that it was merely a retread of the original. There's an obstructive government worker, a nerdy little guy ges taken over by evil, and the climax sees a giant ghost walking the streets of New York. To all that evidence we say this: who cares? Dr. Janosz Poha is possessed by the spirit of Vigo the Carpathian, a 17th century tyrant trapped within a painting in the gallery. He order [sic] Janosz to locate a child that he can transfer his spirit into, thus gaining physical form upon the approaching New Year. The front (and side) of the packaging call this "Possessed Janosz," but the back just calls him "Dr. Janosz." It's not an error, per se, just something worth noting because it will fill up precious space next to the main photo of the toy. Handy! Shouldn't it at least be "Dr. Poha," though? Despite his name and crazy accent, Janosz claims to be from New York's Upper West Side. Or as he said, "Upper Vest Side." Dr. Janosz (which, considering it's his first name, makes him sound like a quack. Think about it: Dr. Laura, Dr. Nick, Dr. Phil... they're all crackpots! [So Dr. Drew would be the exception that proves the rule? --ed.]) 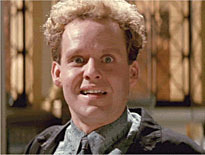 was played by Peter MacNicol, who you'll recognize from Ally McBeal if you're a terrible person, or from Numbers if you're awesome. He also voiced Kirk Langstrom on The Batman, Doctor Octopus on Spectacular Spider-Man and X the Eliminator on Harvey Birdman. The figure is wearing the same outfit he is when we first see him: a blue, patterned shirt, a dark coat with the sleeves rolled up, and brown pants. 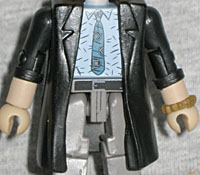 It would have been nice if his necktie were the separate piece used on Tony Stark (and others), but it's not necessary. 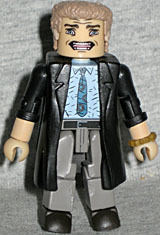 The jacket is the same mold used as Egon's labcoat, but being repainted black, and the addition of the "rolled sleeve" cuffs, gives it a unique look. He's also wearing a brown watch, which is accurate to the film, but probably could have been overlooked. Janosz (pronounced "YAN-ohsh") has a ridiculous, manic look, but that was pretty standard for him throughout the film. He could be hitting on Dana, or, yes, possessed by Vigo, or even happy to be drippings with goo after his violent, prolonged, transformative psychic episode. 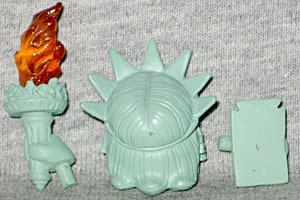 The figure includes an alternate hair piece, with a built-in party hat. It's a red hat, with white letters reading "Happy New Year." He wore it near the end of the film, but credit to Art Asylum for doing their best to get the right font on there! The Statue of Liberty, symbol of freedom for generations, comes to life on New Year's Eve - via a healthy coating of positively-charged mood slime - piloted through the streets of New York by the Ghostbusters for a date with Vigo the Carpathian! This may seem like an odd tangent, but on 9/11, there was a lot of talk on the news about whether or not it was a case of domestic terrorism. Not to undercut the importance of giving voice to every random thing we were thinking and feeling that day (seriously - for our younger readers, we were all scared stupid, and saying any words at all to each other helped), but it was immediately obvious that this was a foreign operation. Why? Because all the way up through September 10, 2001, nobody in America gave a crap about the World Trade Center (unless they worked there). It meant nothing. It lacked the symbolism within the country that the Saudi hijackers assumed it did. An American attacker would have known that if you want to hurt us, you hit the Statue of Liberty. The official name of the statue is "Liberty Enlightening the World," and it's a representation of the the Roman goddess Libertas - that's why she wears a stola (the female equivalent of a male toga). This Minimate is the standard 2" tall, so she's just a mere four whole feet shy of being truly in-scale with the others. Her dress is a separate piece, and it blocks most of her articulation: she's clearly designed to take the famous pose, nothing else. There's a notch in the front of the robe to allow her left foot to peek out; you'd never know it from ground level, but the real statue is sculpted striding forward, stepping on shattered chains; unfortunately, there's no equivalent gap in the back for her right foot (and she comes with no chains). The statue was created by French sculptor Frederic Bartholdi, and he most likely based the statue's face on his own mother's: he never actually revealed the model, but when questioned, he didn't deny it. The Minimate's face is simple, but it's going to look right no matter what, thanks to its pale green coloring (on the real statue, a natural patina that is nearly as thick as the underlying copper). Libby doesn't have any real "accessories," per se, but she does get a few new pieces beyond the stola. Both hands are new, because they're molded holding her tablet and torch - yes, molded. They're not removable, so don't get miffed when you try to take them out of her hands and insist we told you you could. She also has a separate piece for the hair and radiant crown. Well, it's not a crown: it's a diadem, which is different symbol of royalty. Libertas usually wore a phrygian cap (the distinctive hat given to freed Roman slaves), but that had become a symbol of radical revolutionaries by the time, so it was cast aside. The flame of the torch, which in real life is a reproduction covered in gold leaf, is here translucent orange plastic, but it's also larger and more ornate than the real thing. It's almost like they were trying to make it a real flame. Before the statue was erected by Gustave Eiffel on Liberty Island (not Ellis Island, no matter what you think you learned in elementary school), it was shown in pieces all around the city - the French had paid for the statue, and it was up to Americans to pay for the 89-foot pedestal. But then as now, we were all tight-fisted skinflints unwilling to shell out for anything that didn't immediately benefit us (*cough cough healthcare cough*), so after a year of fundraising, the pedestal was only 15 feet high. 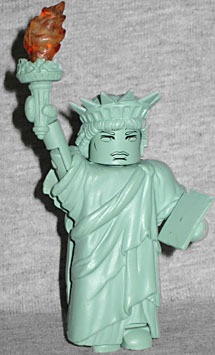 The point we're making is that the Minimates' modular nature works in Liberty's favor: if you take her apart, you're reenacting history! Or maybe the ending of the film novelization, where her torch and tablet were in the wrong hands when they returned her to the harbor. And if nothing else, you're going to want to take her dress off at least once - not because you're an agalmatophile, but because her chest is painted with goo. [giggity! --ed.] 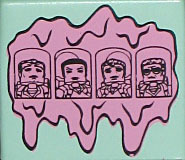 It's the mood slime that let the statue move, and all four Ghostbusters are painted on there, as well. Technically they should be in her headband, not her chest, but it's still a neat little Easter egg. We're taught in school that the Statue of Liberty was the first thing immigrants saw when they crossed the ocean to America, but that's not true: before they got that far north, they had to pass Coney Island, where a 122-foot-tall hotel/brothel shaped like an elephant could be seen. Classy. Nothing should get in the way of you grabbing this Minimate set, however: even if you don't like Janosz all that much, getting a playable Minimate of one of the world's most recognizable structures is really, really cool.